This now nationally-renowned bakery was started in 1994 out of an old New England pizza parlor, specializing in gourmet cakes for local restaurants. Due to popular demand, Dancing Deer adopted a more extensive menu and expanded to a small bakery which was opened to the public in 1996. After winning an “Oscar” of the food industry for their famous molasses clove cookie and receiving national accolades as the bakers of the “best cake in America,” the company launched a 24-hour toll-free number, and expanded nationally. The rest is history. A national bakery, focusing on combining classic, small-batch baked goods with innovation and beautiful, artistic packaging. Dancing Deer offers seven traditional, yet unique brownie flavors. Some of these delicious varieties include their classic, best-selling chocolate chunk brownies and their one-of-a-kind lemon blondies. Other flavor options included caramel pecan, cappuccino and peanut butter. This bakery also creates decadent gluten-free fudgy brownies, that are so good most testers cannot even tell the difference. As a nationally-acclaimed bakery, Dancing Deer also offers a wide selection of other delightful baked goods including cookies, cakes, chocolates and more. Dancing Deer does not have their brownies available for individual purchase; however, customers can buy their favorite flavors in beautifully-packaged boxes of eight morsels. If you want to sample everything this bakery has to offer, they have brownie sampler boxes, as well as an assortment of baskets and towers that incorporate brownies along with their other famous baked goods. Dancing Deer only uses the highest-quality ingredients to craft their famous goodies. They believe in purity and freshness, never using any preservatives in their products. All of their brownies and baked goods are baked from scratch and Kosher-certified. As previously mentioned, Dancing Deer offers gluten-free brownies which are baked in a certified gluten-free facility. Looking for special, seasonal treats? Dancing Deer offers fun and festive medleys and samplers for every season, such as their current Halloween and Fall assortments featuring pumpkin, ghost and bat shaped goodies, as well as pumpkin-flavored cookies. We love Dancing Deer’s dedication to top-quality ingredients and seasonal baked goods. Unfortunately, they do not currently offer sugar-free or vegan options, and do not use many exotic or unique ingredients in their products. This bakery offers both a six-month and 12-month brownie of the month subscription—perfect for gifting or as a treat for yourself. Want to try some of the other popular baked goods that put Dancing Deer on the map? 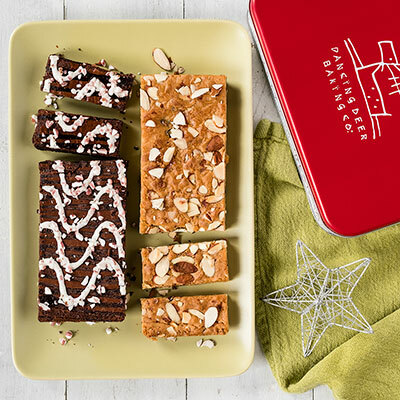 They also offer six and 12-month cookie of the month clubs, as well as six and 12-month gift of the month subscriptions which send the recipient an assortment of their most popular brownies and cookies! If you are shopping for a perfect Birthday gift, Dancing Deer also has a six or 12-month Birthday gift of the month club, which showers the recipient with birthday-love year round, starting with a cake and also including brownies, cookies and other treats. Although they do not offer brownies for individual purchase, Dancing Deer still has a wide selection of price points, to ensure everyone can find something that fits into their budget. The vendor offers several boxes and assortments that are less than $25.00, with prices starting at $14.99 for their chocolate chunk brownie nibbler—a set of four of their gourmet chocolate chunk brownies, individually wrapped and artistically packaged. If you have a preferred variety of brownie, samplers of eight individually wrapped brownies in specific flavors are available for $22.99. Larger brownie assortments include their signature brownie sampler, which contains 12 individually wrapped brownies for $39.99 and their classic brownie sampler, with 16 brownies in four of their most popular flavors for $42.99. If you are looking for something larger with even more scrumptious sweets, Dancing Deer curates larger assortments and towers, which include their popular cookies, brownies, cakes and more. These assortments start as low as $22.99 for their seasonal caramel pecan & pumpkin gift box, which includes eight cookies and four brownies and top off at $149.99 for their deluxe cake, cookie & brownie baskets, with something for every one to enjoy. Dancing Deer does not use any preservatives in their products, and guarantees they will arrive fresh and intact, although they do not guarantee that they are baked and shipped the same day. All brownies are carefully packaged with cellophane and bubble wrap to ensure that no breakage occurs during the shipping process. In the warmer months, Dancing Deer uses ices packs and other precautions to prevent melting and ensure freshness. Complimentary shipping is not included with purchase, and costs are calculated based on the purchase total. Shipping costs range from $7.99 to $22.99 for ground, $17.99 to $31.99 for 2nd Day and $26.99 to $40.99 for overnight – all depending on merchandise value. Thanks to their wide assortment of baked goods, Dancing Deer has a wonderful selection of gift options for every event in your life. At Dancing Deer, customers can shop the bakery’s beautifully-curated gift baskets and towers, which include a mixture of their delightful cookies, brownies, cakes and chocolates. Want just one type of goodie in your gift? Dancing Deer also carries a diversity of brownie gifts, cookie gifts, cake gifts and chocolate gifts. If you have something specific in mind, Dancing Deer will let you build your own gift tower, from an assortment of their items. Gift packaging and aesthetics are very important to Dancing Deer, in fact they think the packaging should be as artistic and good as their baked goods! Dancing Deer uses their signature boxes, environmentally-friendly wooden boxes, beautiful baskets and other wrapping, depending on the gift that you select. If you are shopping for a specific Holiday or event, they offer special wrapping with themed tissue paper and ribbons. Some of the occasions available include: Birthday, Thank You and Congratulations. As mentioned before, Dancing Deer also offers gifts based on the current Holidays, which are wrapped in with festive ribbons and paper for whatever the season may be. If you are looking for a corporate gift, Dancing Deer has an excellent business gift program. 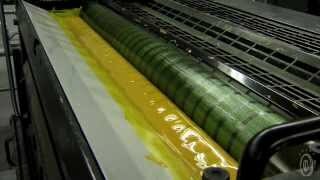 They offer volume discounts and gift personalization such as silk-screenings, imprints and hangtags. They can also incorporate business cards and marketing materials into the gift presentation. In addition to online and phone ordering with their business gift specialists, Dancing Deer also has a digital business gifts catalogue to make the process even easier. It is easy to contact Dancing Deer with questions, concerns and comments. They can be reached at any time through their toll-free number, customer service email and a submission form on their website. Orders can be placed securely on their easy-to-use website or via their toll-free, 24-hour hotline. Dancing Deer does not currently have live chat capabilities or an FAQs section. They do have a business FAQs section, which will help those placing corporate orders. They do not have a blog or other interactive features at this time, which we would love to see. This well-known bakery, with brownies voted to be “America’s Best Brownie,” is ideal for those on the hunt for the perfect gift. Dancing Deer carries a wide range of excellent gift assortments, baskets and towers, with holiday-specific and seasonal gift wrapping options. 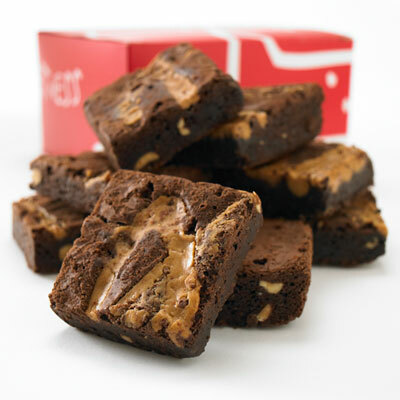 Their wonderful brownie of the month subscription options also make perfect gifts for just about every event. This bakery is also ideal for those in need of Kosher and gluten-free baked goods. Since they do not sell individual brownies and tend to focus on gift presentation, this bakery is not ideal for those looking to purchase for themselves. It is also not a good option for those looking for vegan or sugar-free baked goods. We like that Dancing Deer has a gift option for just about every budget and event with their diversity of gift options and prices. We also like that they are Kosher certified and have gluten-free options. Their seasonal-themed treats are a fun benefit as well. Our favorite perk is their month subscription options, one of which is certain to delight any sweet tooth. One drawback of this bakery is that they do not have individual brownies for purchase, and gear all of their assortments towards gifting. This is great when shopping for others, but not ideal when looking for some self-indulgence. They also do not have vegan, sugar-free or exotic offerings, which we would like to see. Tags: browniesdancing deer baking co.